In a “whisper of time,”2 the predictions of futurists have become front-page news. Work as we have known it for centuries is obsolete. If you participate in teleconferences, communicate via e-mail, or share information with colleagues on web sites, you work virtually. What is driving this new way to work? Continuous, wild change at break-neck speed; new, newer, and newest technology; globalization and localization; and a demand for social as well as financial performance all typify business in the Internet Age. Like Odo, the Star Trek shape-shifter on Deep Space Nine, work is dematerializing and rematerializing right in front of us. For centuries we’ve worked primarily face-to-face for the same boss. Now we work virtually across distance and reporting lines. The global communications web that makes everyone on the planet neighbors—long imagined in science fiction—is in place. Nearly every country in the world has Internet connections (Figure 1.1).4 Coupled with such connectivity is the sheer complexity of markets and customers. Nothing is simple anymore. It is now rare that individual companies carry out projects completely by themselves. 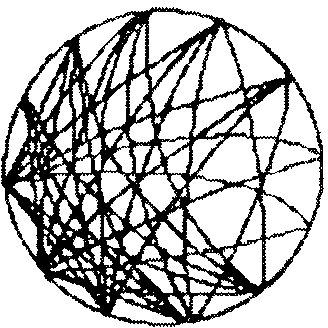 Our own Internet start-up involves a core group of 10 people surrounded, linked to, and intersecting with 10 times that many more, each of whom has his or her own tens and hundreds of connections. Our project, like yours, crosses internal and external boundaries, drawing together members situated anywhere and everywhere. Consider Valent Software, the emblem of 21st century business. Its 10 employees never really co-locate, yet within three years they turn a $700,000 investment into a $45 million sale to a major web portal. They provide Lycos Clubs, a community-building facility critical to Lycos’s success. Allegiance to our projects is as strong as it is to our companies. “Who’s the boss?” is a good question—if you even have one, or perhaps you have two. You may be part of a small team that sees something that needs to be done—then does it. All of you are leaders in your own domains. Perhaps you all work for different people who themselves cross in ever-wider circles of connections. Before long, you may find yourself like the Time Based Notification team (TBN) at Sun Microsystems where 60 percent of the members moves on to its successor project, the Glass House Gang (see Chapter 5, “Place”). They do their first project on a shoe-string and the next with strong corporate investment. Move in Sun's case is a relative concept. People don’t “move” anywhere physically. Instead, trust binds them as they can live primarily online. This is where the team works. To work on TBN means to go online. Face-to-face meetings become ever more precious and increasingly rare. The 9-5 office as we have known it is more often than not—not. Fully one-third of the 25,000 dwellings in our city, Newton, Massachusetts, house “white-collar” businesses. “White-collar” itself is on the express train to antiquity. What with “casual Fridays” having crept backwards through the work-week, even suit manufacturers are called upon to update their lines. You attend meetings in your pajamas, talk with people halfway around the globe, use insomnia to catch up online, worry about head-set not car-seat comfort, and partner with people you have never—and may never—meet face-to-face. An MCI commercial got it right: The woman with bed-head in her slippers on a con call dreading the advent of video conferencing. Human beings have always worked and socialized in face-to-face groups. Now people no longer must be in the same building—never mind on the same continent—to work together. They belong to virtual teams that transcend distance, time zones, and organizational boundaries. The use of teams is on the rise, and with a quarter of a billion people on the planet already online,9 the face-to-face aspect of normal working relationships is changing dramatically. Until the advent of the web, such ways of working simply were impractical. A few thousand lines of computer code written in Switzerland in 1989 to help out a network of particle physicists10—coupled with unprecedented advances in technology—have transformed the world. In four years, the number of adult Americans online went from 9 percent to 56 percent.11 They have access to a billion pages of content worldwide12. At last, the planet is wired—though “wired” is not entirely accurate either. Much of our interconnection is wireless. Connected, linked, matrixed. We are the future here now. Distance-defying communication opens up vast new “territory” unbounded by space or time, for “working together apart.”17 For the first time since nomads moved into towns, work is diffusing rather than concentrating. Officially, we have moved from the Industrial to the Information Age. Working across boundaries—in partnership over corporate lines with vendors and customers, in alliances with complementary enterprises, and in deals with direct competitors—is the norm. There, on the web, business boundaries blur. “Name the Collaborators” is the new game. Lycos, the portal that goes public 10 months after it is founded,19 is itself a network of 13 other sites. Ask Jeeves a question (you don’t need the “http://,” the “.com,” or even the Jeeves—the three leters “ask” alone will get you there) and you go to a Webcrawler site with banner ads for AT&T’s online billing and Barnes & Noble, each just a finger flex away. Click and you’re on a site in Tasmania or Toledo (Ohio) or Toledo (Spain). Place itself has dissolved, a current reality declared in The Death of Distance20, the 1997 book by Economist writer Frances Cairncross. When is the last time you worked on a project only with people whose offices or desks are near yours? Boundaries that separate functions and divisions within companies have become porous. People rarely work only by themselves. Even solo, independent contractors spend most of their time working in teams. The boundary-crossing, virtual team is the new way to work. When General Electric does a late-1990s assessment of critical capabilities for the future, it finds that “the skill of leading virtual teams is the new requirement,” says Russ Baird, head of GE's Six Sigma Quality Training at the corporate Leadership Development facility at Crotonville, New York. “We zeroed in on the skills for continued success and it became obvious that teams are more virtual than they’ve ever been and are rapidly becoming more so. Projects are becoming larger with multiple sub-teams crossing lots of functional as well as geographic boundaries. We have and need very diverse teams to address projects of this scope.”22 Since 1998, GE has been training its famous “Black Belts” in virtual teaming. Jack Welsh, the company’s chairman and chief executive officer, who all but brought the word “boundaryless” into the business lexicon, has made e-commerce the top priority for all the companies in the portfolio before he retires in 2001. His organizational-networking imperative is paying off—GE is the first company in history to report $10 billion in earnings. With the technology and connections finally in place, now we face the truly difficult part of the virtual equation—the people element. Real groups are notoriously complicated. Anything that goes wrong face-to-face also goes wrong online, only faster and less gracefully. Going virtual23 is for most people a wrenching experience, both in adapting to new technologies and in adopting new behaviors and working relationships. Virtual teams are the people-operating systems for the 21st century. Like GE, many companies—large and small, old-line and broadband-new—are experimenting with different ecologies of people, organization, and technology. Of considerable consequence is how those who had access to collaborative technology from the beginning use it today. A stop on this journey is a company that always has lived by the technology it makes. Highly decentralized into seven independent divisions, Sun maintains an extraordinary information infrastructure to support its 36,000-person company. What other companies manage with more people, Sun tries to achieve with better and faster communication. Some Sun people say they no longer use paper at all. When web technology explodes in the mid-1990s, Sun embraces it immediately everywhere. Several thousands of web servers go up in a matter of months all across the company. CEO Scott McNealy’s 1995 corporate-wide injunction “to operate on Internet time without compromising quality” sets a daunting new standard. The company also launches a multi-year initiative to solve customer problems with cross-company teams, SunTeams (see Chapter 5, “Place”). Looking to the new millennium, the company decides to up the ante for itself again in 1999. Sun will become eSun. All e-commerce customers will come to one Sun front door on the web, www.sun.com. Everything else will flow from there—from online purchasing for all products to MySun.com where customers and employees will customize their own ways to work with, through, and at Sun. The job of “dot-coming ourselves” falls to a Sun vice president and general manager from the field. Al Ormiston is just wrapping up his last special assignment—re-integrating Sun’s aftermarket business into another Sun division. SunExpress had been spun off and now the company had brought it back inside. “There was lots of emotion,” Ormiston recalls. “Then the world exploded and everything was ‘portal this’ and ‘portal that.’” The re-integration unwittingly but opportunistically gives birth to the next major change in the way Sun does business. The company that promises to “dot-com” everyone else faces a very big challenge. It has to break new ground faster than its customers and its competitors. At the same time, it calls on its own fiercely independent people to overcome their natural resistance to ceding powerful decentralized control. One eSun means consistency across areas that always have been autonomous in the divisions—inventory, purchasing, pricing, terms, and conditions not to mention back-end technology choices that are extremely important to engineers. “They could all do their own thing in the past. It was a real tangled web,” but after a few years, Ormiston says, “the web forced everyone to take the same approach. We needed a single web buying environment.” Instead Sun had four major divisions each with its own sales organization and business rules. With eSun, customers come in through the same front-end and go to one store. To avoid setting up a “central group with a mandate-like structure,” Ormiston instead sets up a virtual organization. First he works with each division to name its own eSun vice president, who reports both to the division and to eSun, along with eSun Program Management Offices that have the staffs to maintain them. Communication is intense. The eSun program management officers have two or three conference calls a week. The same group comes together face-to-face for a day twice a month. And the directors from each division meet face-to-face for a day once a month. How many people does it take to add the “e” before the company’s name? Ormiston estimates that a little more than one percent of the company is involved in eSun, 400 in total with 100 on the business-side and three times that many on the information technology-side. It’s refreshing to talk to people at Sun. They admit that life is difficult in the Network Age and earnestly use their own behavior and technology to improve. In a word, it feels different. It’s a blurry messy world and everyone is scrambling to catch up. The younger generation may have natural advantage in the new world but leadership in the morphing business environment remains complex. Two generations of leaders, old-line company, new thinking. Robin Abrams, a self-described “gray-hair,” has grown up with the Internet, switching courses and careers with the times. Originally a banker, Abrams comes to Chemdex as chief operating office from the presidency of Palm Computing, as in the hand-held devices that people stare and poke at during meetings. Before Palm, she was president of Hewlett-Packard’s VeriFone, one of the original virtual companies (their product is entirely virtual—the electronic banking system for credit card purchases—and they have created a culture to match). Prior to Palm, she ran sales on various continents for Apple. Never mind that she has a law degree and a bachelor’s in science. We first meet Abrams in 1995 at the launch meeting of Apple’s international engineering group in Tokyo. She heads Apple’s sales and marketing in Asia and stops by the meeting on her way from Hong Kong (where she, her husband and two young daughters then lives) to Apple’s Research and Development campus in Cupertino, California. Even though Abrams is riding the crest of Apple’s wave in Asia with market share above 20%, she drags her own suitcase behind her through Tokyo’s subway maze, and jumps into the conversation within moments of entering the meeting. Eight months after she comes to Chemdex in June 1999, Abrams moves jobs again, keeping the same position in Ventro Corporation, of which Chemdex is just a part. Ventro is one of the new breed of “business-to-business vertical marketing companies;”26 Chemdex is one of the verticals. Builds the business rules of each participating company into their online use. Until Chemdex, Abrams has never negotiated a single contract without meeting her partners face-to-face. “Momentum is so important now,” she says. “You don’t have six weeks to build bridges.” Abrams reflects this speed in her speech. Even with a headphone on and typing at top speed using electronic shorthand, it’s hard to take down her words as rapidly as she fires them out. Ventro, like many similar companies, has a great cultural challenge: “To blend the talent between young bright minds and the gray hairs,” she says. “The management team has to be ready, willing, and able to learn. The pioneer is always tweaking the model so you have to hire people willing to learn and course correct on the fly. The need for adult supervision is a new organizational requirement in the 21st century. Before we know it, 10-year-olds will be running the world. Perhaps they already are. Since the 1990s, a new generation has come into business positions previously reserved for people two or three times their ages. Why? Because the new entrepreneurs have the ideas and the skills to work in the new way—but not yet the business experience to apply them. There’s room for both generations. Rear Admiral Tom Steffens, director of the Center for Intelligence and Information Operations at the U.S. Special Operations Command in Tampa, Florida, has his own experience of the generation gap. “I always find that I am about two thoughts behind in any ‘chat session’ I have with my son who is a sophomore at Virginia Tech. From the perspective of the younger generation, it’s equally complex. “We have 26-year-olds who’ve only ever had one job before managing large groups of very smart Ivy grads,” says Jay Albany, who is 23. It’s not uncommon for people in Albany’s position in start-ups to work 16-hour days. This is fast work but it’s not necessarily smart, which is where the voice of experience makes its contribution in the Internet economy. “Not real” but “appears to exist,” something “that appears real to the senses” but is not in fact. Virtual as in “virtual reality,” a recent meaning invented for an emerging capability. When we use the term virtual, we do not mean it in the first sense the way an old American TV commercial for audiotape did: “Is it live or is it Memorex? With Memorex, you can hardly tell.” With a virtual team, you can tell: Virtual teams are living, not Memorex. They are most definitely real teams, not electronic representations of the real thing. The third and newest meaning of “virtual” attests to forces that have moved teams into an altogether different realm of existence—virtual reality—or more precisely, digital reality. Electronic media together with computers enable the creation of new kinds of spaces. They are real to the groups that inhabit them yet are not the same as physical locations. With electronic technology, virtual teams provoke entirely new ways of working and organizing. To physically travel across distances faster than the speed a person can walk requires technologies and authorities—captains of ships that sail across oceans to new worlds, engineers guiding trains that chug over mountain ranges to new frontiers, and aircraft pilots for safe takeoffs and landings. In cyberspace, you are captain; you steer. Virtual? Yes. Having no real existence? No. 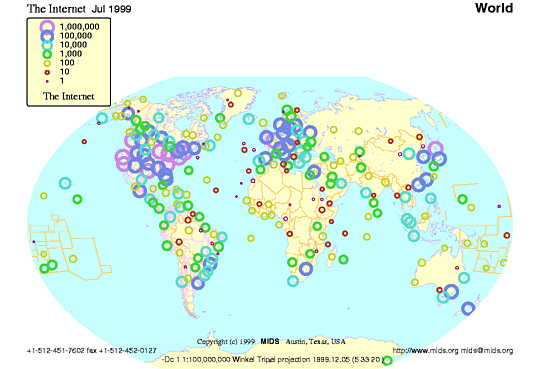 In 1989, the particle physicists at CERN (Conseil Europen pour la Recherche Nucleaire)29 in Geneva, Switzerland, start to develop protocols that will give them a powerful new way to interconnect their global research community using the Internet. The essential technologies and agreements that make the web possible are very simple and come from humble beginnings. The astonishingly easy-to-use computer language for designing web pages is called HyperText Mark-up Language (html) and the communication that connects web sites follows the now-famous standard, HyperText Transfer Protocol (http). By 1993, the required protocols are in place and in the fall of that year, students at the University of Illinois, including Marc Andreessen, who went on to found Netscape, created the NCSA Mosaic browser. With an easy way to steer through cyberspace, the World Wide Web took off and never looked back. In a few short years, the web has become the communication phenome extraordinaire. Suddenly anyone with Internet access can explore a billion postings around the world on nearly every conceivable topic, gliding from continent to continent in click-of-a-mouse time. Ted Nelson and Doug Engelbart are among the earliest seers in the 1960s to envision the possibilities of hypertext and the resulting global web of networked knowledge. The word hypertext is self-descriptive: It is text that is hyperactive. Anything written in hypertext (or any data element) can become what amounts to a computer button of its own, representing the simple but profound linking capability. Click your mouse and off you go to that destination. This means that everything on the web can be interrelated—linked. Companies, libraries, universities, governments, hobbyists, nonprofits, politicians, social activists, families and just plain folks all have jumped on to the web. For virtual teams, the use of password-protected sites brings a singular value. For the first time, teams can virtually co-locate all the information and interactions they need to work together in context. That does not mean that all the team’s information is on the site, but it does mean that the site can point you to wherever you need to go. Pointers are embedded in text, outlines, graphics, maps, and other media. Virtual reality for virtual teams is already digital and rapidly becoming conceptual. The eruption of the web allows virtual teams to create private digital places. These interactive sites—protected, members-only islands within the global Internet ocean—signal a sharp up-tick in the human capability to group. So what exactly is a virtual team? A virtual team is a group of people who work interdependently with a shared purpose across space, time, and organization boundaries using technology. Face-to-face interactions among people from the same organization typify old models of teamwork. What sets virtual teams apart is that they routinely cross boundaries. What makes virtual teams historically new is the awesome array of interactive technologies at their disposal. Webs of technology and trust link virtual teams. Regular meetings, encounters in the hallway, getting together for lunch, dropping into one another’s offices—these paint our conventional portrait of getting things done. People do not routinely see one another when they are in different places, spread out around the world, or even housed in different parts of the same city. Motorola, for example, has some 20 locations just in the Northwest Chicago area, each of which has multiple buildings. Many teams today never meet face-to-face but work together only online. Such is the case with the 1250 employees of Buckman Laboratories in Memphis, Tennessee, who form and disband numerous situation-specific virtual teams on a daily basis—even though the people in them are spread all around the globe. One major reason why many virtual teams fail is because they overlook the implications of the obvious differences in their working enivronments. People do not make accommodation for how different it really is when they and their colleagues no longer work face-to-face. Teams fail when they do not adjust to this new reality and close the virtual gap. What first comes to mind when you think of a team? A group of people working side-by-side, in close proximity to one another—a basketball or soccer team, perhaps? The startling data that MIT Professor Tom Allen has been compiling for the past several decades show that the radius is very small. The probability of communicating or collaborating more than once a week drops off dramatically if people are more than the width of a basketball court apart. To get the benefit of working in the same place, people need to be quite close together. To put this in perspective, think of the people you regularly work with. Are they all within 50 feet of you? Or are some of your coworkers a bit more spread out, down the hall, on another floor, in another building, or perhaps in another city or country? Increasingly, the people we work with are no longer within shouting distance. Any team of more than about 10 or 15 people is by sheer physical mass probably more than 50 feet apart (Figure 1.4). Globally, the farther apart people are physically, the more time zones they must cross to communicate. Thus, time becomes a problem when people who are not in the same place need some of their activities to be in sync. The window for routine same-time (synchronous) work shrinks as more time zones are crossed, closing to effectively zero when people are on opposite sides of the globe. But even people who work together in the same place can have problems being in the same place at the same time, like those in sales or consulting who rarely occupy their offices at the same time. 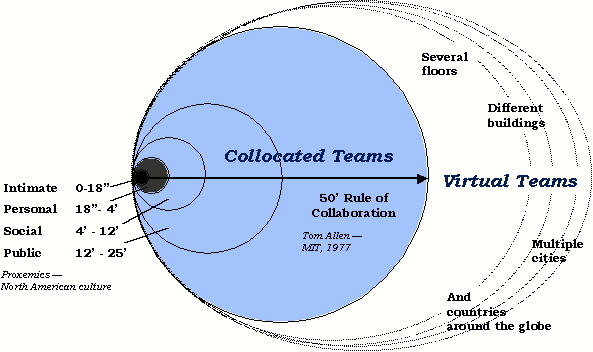 Even apparently co-located teams often cross time boundaries and need to think virtually. Do all the people you rely upon to get your job done work for you or your boss? Probably not. Most core business processes require that people regularly work across organizational boundaries. Supply chain management, marketing, product development, sales, quality improvement, and change management are just a few activities that require virtual teams to work over walls and across borders. Large-scale systems change invariably requires teamwork across organizational borders. To reinvent its administration and information management system, the U.S. Department of Commerce involves hundreds of people in teams from five major bureaus and dozens of smaller organizations. Usually numbering eight to 10 people each, these virtual teams also comprise scores of contractors who provide everything from consultation on change management to software programming. Alliances, joint ventures, and partnerships all require companies to establish cross-boundary teams. Doing together what we can't do alone. Leverage learning by capturing knowledge in the natural course of doing the work, gaining wider access to expertise, and sharing best practices. Virtual teams are not just a great way to organize and make use of cutting-edge technology. Whether consciously or not, many companies are betting their future on virtual teams as their strategic differentiator. By employing virtual teams, they can do things that are impossible within the prevailing model of side-by-side, 9-to-5 work. Virtual teams are a strategy for success. If they cannot accomplish their goals within their own four walls, net-savvy companies climb over them and partner with someone or several someones with whom they can make it happen. If their competition suddenly overpowers them, 21st-century organizations see virtual teams as the way to become smarter and more flexible, adaptive and more competitive. The way is not easy. Virtual teams are microcosms of the organizations and environments that spawn them. Today’s teams are complex and reflect all the stresses and strains induced by the extraordinary shift in human civilization now completed. As the Industrial Age recedes and the zenith of the Network Age looms ahead, we and our groups are stretched betwixt and between. We are born into the old age past, yet must navigate in the new age present. Old management molds that funnel information up and send orders down are cracking apart. More information is more omnipresent to more people. Competitive pressures to constantly improve cost and quality drive radical redesign of business models and work processes. All the while, information seeks its natural path, defying gravity, flowing with its own simple process physics, mindless of boundaries drawn in the physical world. There is a virtuous feedback loop33 building in the development of virtual teams that promises an exponential rise in performance. Virtual teams are not a fad. They are here to stay and soon to be ubiquitous. This virtuous loop story begins with yesterday’s assumption that people must co-locate to work together. “Shoulder-to-shoulder” the traditional team works together, handing off their work to the next team in chains of larger processes, the bucket-brigade view of working groups. Organizational building blocks of closely spaced bodies stacked in command-and-control pyramids. This is the idealized machine organization of the Industrial Age. Today, however, technology, speed, globalization, and complexity are rearranging this root premise of work design. Two things happen: distance and time become problems to solve and organizational issues develop within rigid hierarchy-bureaucracies. To deal with the demands of competition that force cross-boundary work, organizations create virtual teams. Electronic, particularly digital, media that people typically use to compensate for distance eventually create new possibilities. Entirely new ways for people to work interactively lead to new networked forms of organization. As the shift to information work accelerates, new energy is pumped into the system as increasingly more work is devoted to digital products and services. As the technologies and processes of virtual work improve, more work is designed to gain virtual benefits. This only fuels the accumulating trend toward virtual teams, making it easier for them to come together and work interdependently. More virtual teams mean more networked organizations replacing or transforming traditional hierarchy-bureaucracies. More virtual teams in the newly fertile digital environment also mean we have the possibility of regularly reaching heights of performance and group intelligence only rarely experienced by traditional teams. A good virtual team is, at its heart, a good team. Since many virtual teams do meet periodically or a few times or at least once, they also find themselves in the conventional face-to-face setting. We are untrained for life and work in the fluid, instantaneous global “village.” Thus, we need new models for teams that also incorporate the timeless features of working together. People, Purpose, Links, and Time. People populate and lead small groups and teams of every kind at every level—from the executive suite to the subcommittees of the local school’s parent association. Purpose holds groups together, which for teams means a focus on tasks—work progressing from goals to results. Links are the channels, interactions, and relationships that weave the living fabric of a group unfolding over time. The greatest difference between in-the-same-place teams and virtual ones lies in the nature and variety of their links. Time is a dimension common to all life and it dominates virtual teams—schedules, milestones, calendars, processes, and life cycles. Work in a world where the sun never sets is very complex. There are few maps and lots of complaints. People are trying to feel their way, uncertain that they are making the right decisions. For virtual teams and networks to be truly transformational, they must include what is timeless and enduring in human groups. They also need to reflect the features that are really new in the turbulent years following the turn of the millennium. The organizing challenge of our time is to learn to work in virtual teams and networks while retaining the benefits of earlier forms. 1 We found this quote on the Context Institute site, http://www.context.organization/GROUPS/CW/paper.htm. We sent email to Jaime Snyder, Fuller’s grandson, to figure out when and where Bucky said this. Jaime’s reply: “It is certainly fine to use quote: but I do not know its source. It certainly sounds like Bucky and the idea is consistent with his thinking but I do not know where it might be from. If you have access to a Synergetics Dictionary (a wonderful out of print four-volume research book) at a library you might be able to determine its source. Email from Jaime Snyder. 2 From an interview with Jim Lynch. 3 Andy Campbell, an organization development professional from the CIA, first said this to us in a telephone conversation in 1993 while he and we were working on the National Performance Review. 5 “10 Employees. No Headquarters. $45 Million Payoff. Why Lycos Bought a Virtual Company,” The New York Times, February 27, 2000, Business section, p.4. 6 See the book www.newbusinessdimensions.com by Bart Piepers and Marcel Storms, and their website, http://www.newbusinessdimensions.com. 7 E-mail from Bart Piepers, Subject: “Good luck with your book,” January 28, 2000. 8 Interview with John Whyte, CIO, Ernst & Young International, January 24, 2000. 9 See Nua Internet Surveys at http://www.nua.ie/surveys/how_many_online/index.html. 10 For more on CERN, see its web site: http://www.cern.ch. 13 “Computer Industry Almanac Says Over 364 Million PCs-in-Use Worldwide Year-End,” March 23, 1999, http://www.techmall.com/techdocs/TS990323-7.html. 17 This is the subtitle of Ray Grenier and George Metes’ book, Enterprise Networking: Working Together Apart (Bedford, MA: Digital Press, 1992). 19 See Lycos at http://www.lycos.com/information/fact.html. 20 Frances Cairncross, The Death of Distance: How the Communications Revolution Will Change Our Lives, Harvard Business School Press, 1997. 21 Interview with Dr. Henry McKinnell, president and chief executive officer, Pfizer, Inc., January 19, 2000. 22 Interview with Russ Baird, Quality Training Leader, General Electric’s Leadership and Training Facility at Crotonville, New York, January 28, 2000. 23 Ray Grenier and George Metes, Going Virtual: Moving Your Organization into the 21st Century (Upper Saddle River, NJ: Prentice Hall, 1995). 24 Sun’s first machine shipped with TCP/IP (Transmission Control Protocol/Internet Protocol). 25 Interview with Al Ormiston, vice president and general manager, eSun, February 23, 2000. 27 E-mail from Rear Admiral Tom Steffens, director of the Center for Intelligence and Information Operations at the U.S. Special Operations Command, Tampa, Florida. 28 Norbert Weiner, Cybernetics or Control and Communication in the Animal, (City, State: Publisher, year). 29 For more on CERN, see its web site: http://www.cern.ch. 31 For more on the relationship between proximity and collaboration, see Thomas J. Allen, Managing the Flow of Technology: Technology Transfer and the Dissemination of Technological Information within the R&D Or­ganization (Cambridge, MA: MIT Press, 1977). Data are given in The Age of the Network, p. 47. 32 From a slide developed by Shell’s Network Learning & Support Center, 1999. 33 Virtuous is the term for positive feedback popularized by Peter Senge. See his book, The Fifth Discipline: The Art and Practice of the Learning Organization (New York: Doubleday/Currency, 1990).